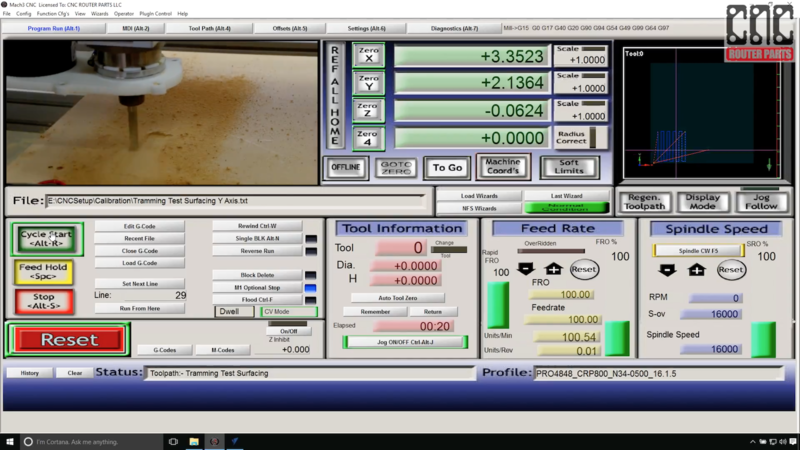 Calibration and tuning your CNC machine will help you achieve consistent and reliable results. There are three primary procedures we recommend after initial machine assembly (and before creating the spoilboard). Table Leveling adjusts leveling-feet so that your machine's two table axes (Y) move along the same nominal XY plane. Gantry Auto Squaring Calibration ensures that your machine's table axes (Y) are coordinated, perpendicular to the machine gantry axis (X). Spindle/Router Tramming verifies that your spindle/tool is making cuts square to the XY plane (primarily concerned with Left/Right adjustment). A convenient method to ensure the table axes are aligned along the same plane is to use a long (4 ' or more) level and adjust the leveling feet such that the table is level along x, y and diagonally. When to Re-Check: When your machine is moved to a new location in the shop. Our machines use a dual gantry drive architecture, meaning there are independently driven axes moving each side of the gantry. They synchronize their motion and auto-square your gantry by homing to their respective Y and Slave axis home sensors. 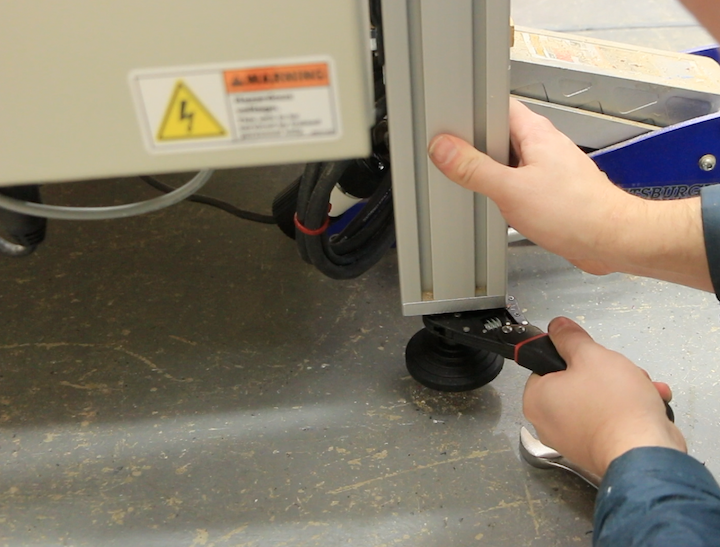 By adjusting these two sensors you can adjust the squareness of the gantry to your machine table. There are multiple methods that will test if a gantry is square. This is the procedure that we use and recommend. Once this is performed the machine can be re-homed and automatically re-squared by using the "REF ALL HOME" button on the operator panel at any time in the future. Step 1: Install the Y and Slave "Home" sensors the same depth (or count the exposed threads). For machines with red bumper plates, leaving the sensors exposed 3/4" thru the plate is typical. Step 2: Home the machine using REF ALL HOME (if this is your first time, check out our initial setup video here). Step 3: Download the Vectric or Fusion calibration project (above under Source Files) and create (or use DXF to create) the calibration test toolpath files (operations are pre-configured). Step 4: Using a1/4" end mill, run the calibration test program to create four dowel hole locations. Step 5: Install dowels (or 1/4" tool shanks will do, just be careful not to cut yourself). 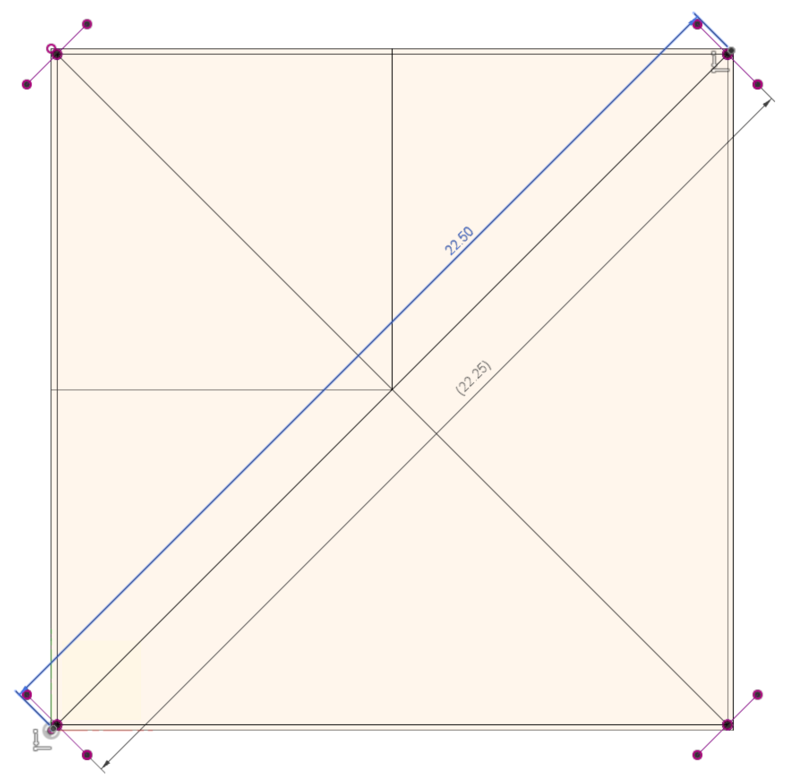 Step 6: Measure outside edge to outside edge on each diagonal with a construction square or ruler and confirm they are the same approximate lengths. Step 7: If they are the same, you are done! Otherwise, adjust the Y axis or Slave axis sensor as needed and go back to Step 4. When to Re-Check: When the Y or Slave Home sensors are moved, adjusted, or replaced. 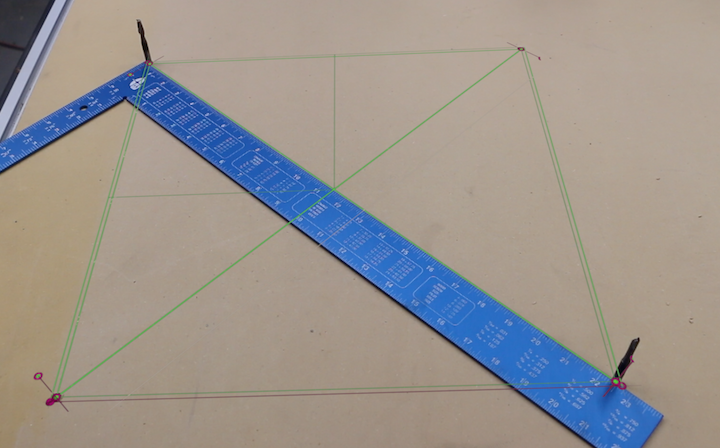 We recommend using a 1/2" or larger flat tool to surface a small test region of a board. Customers will typically use a small 2 'x2 ' or off-cut of MDF for this. 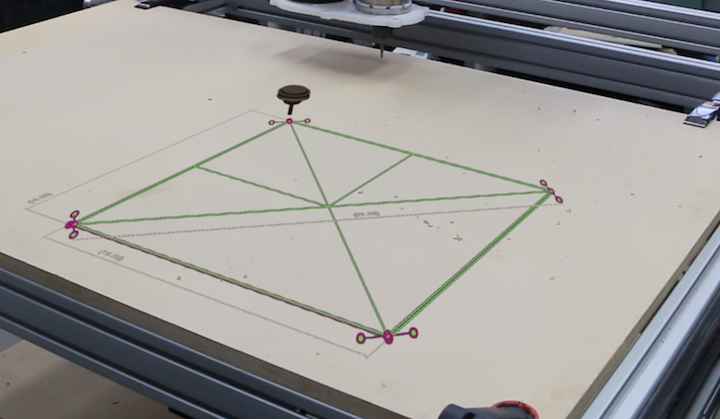 Step 1: Using our Vectric or Fusion 360 project (or using your own), export gcode that will surface a test board with the surfacing running parallel to the Y (table) axis of the machine. Note: The stepover should be nearly the radius of the tool so that an out-of-tram condition will be more obvious, we recommend 90% stepover with most tools for this test. 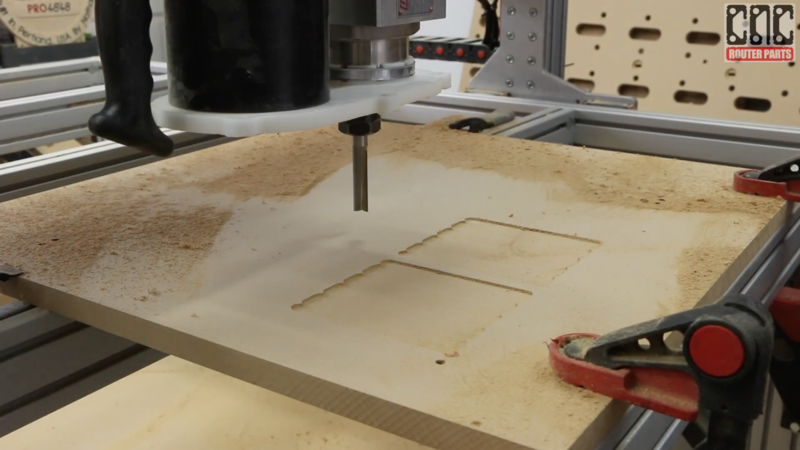 Step 2: Run the test surfacing program (ideally in multiple places) on your CNC machine. Step 3: The resulting surfacing should be smooth with minimal ridges between passes. If it is not, which side the ridges are formed will indicate if the spindle needs to be adjusted clockwise or counter-clockwise. Step 4: If there are ridges, go back to step 2. When to Re-check: When the spindle mount is moved or adjusted.